Wouldn’t you enjoy cookies more if it wasn’t for their crumbly attitude? I know I would. So let me introduce to you cookie flash drives. They act much smarter as they don’t require you to clean afterwards! What they do need is a USB port – because that’s the way the cookie goes! And when it even runs, a red light indicator will let you know. What makes it real chipper though is that you can choose your memory stick filling between 1 and 8GB. Maybe one with green jelly? 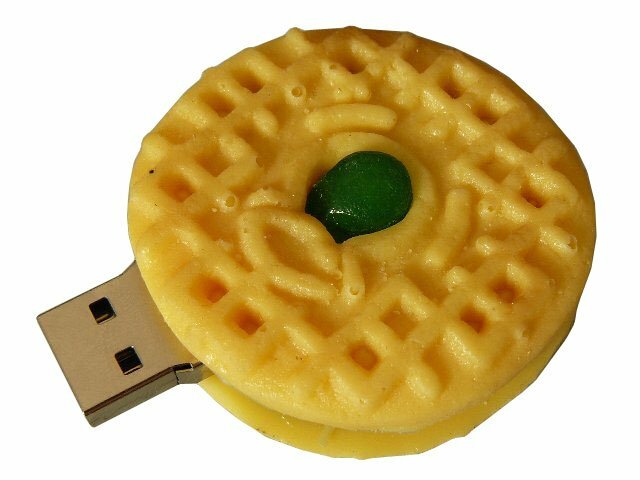 With plastic ingredients and an average weight of 28 grams these flash drives make for some tough cookies. But – they don’t invade your privacy and are easily erasable. Now if you’re like the sesame street monster and can’t get enough of cookie memory sticks then take a look at these special Fortune Cookie Flash Drives. Sure you can. Let me know when you posted it.